A growing body of evidence suggests a genetic contribution in the development of autism spectrum disorders (ASD). Since 2002, Lineagen has been building the largest proprietary collection of ASD-related genetic variants and, in 2011, spearheaded a study to increase the clinical yield of the company's genetic diagnostic test, FirstStepDx. To find candidate variants, Linegean selected the Golden Helix services team as well as the Children's Hospital of Philadelphia Center for Applied Genomics to concurrently perform quality control, analyze the data, and interpret the results. The results of this study were recently published in PLoS ONE: "Identification of Rare Recurrent Copy Number Variants in High-Risk Autism Families and their Prevalence in a Large ASD Population." 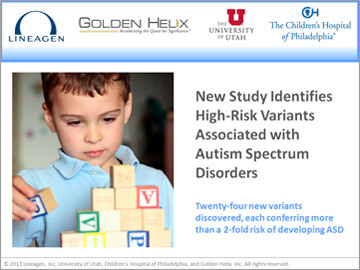 In this 90-minute webcast, Dr. Hakonarson, Dr. Leppert, Dr. Paul, and Dr. Hensel will outline the study and methodology approach utilized by Lineagen to achieve a two-fold increase in detection rate of genetic variants in individuals with ASD, and Dr. Christensen will share the analytic processes Golden Helix used in this valuable research. Dr. Paul is a co-founder and has served as President and Chief Executive Officer of Lineagen since its inception. Dr. Paul has been recognized as one of Utah's leading venture entrepreneurs and was a Utah Governor's Appointee to the Steering Committee for the Utah Technology Industry Commission. Prior to Lineagen, he was President and Chief Operating Officer of Lineagen Research Corporation, Vice President of Business Development at Huntsman Biotechnology Corporation and Director of Strategic Development at NPS Pharmaceuticals. Dr. Paul earned his B.A. from Colby College and his Ph.D. in Molecular Biology and Biochemistry from the University of Utah. Dr. Hakonarson has an intimate knowledge of the complexities of large-scale genomics projects with over ten years of experience in pioneering genomic research and genome-wide mapping and association studies. He is currently the Director of the Center for Applied Genomics (CAG) at the Children's Hospital of Philadelphia. Dr. Hakonarson's work focuses on identifying genetic variants that underlie autism spectrum and other complex medical disorders. Dr. Leppert, Chief Science Advisor and a co-founder of Lineagen, has had a seminal influence on the study of human genetics, with leading contributions to the genetic maps currently in use worldwide for human gene identification. Dr. Leppert has identified disease-linked genes responsible for human epilepsies and macular degeneration, and has collaborated in the identification of numerous other genes that contribute to human diseases, including colon cancer, breast cancer, and cardiac arrhythmias. Dr. Leppert earned his B.A. from Wesleyan College and his Ph.D. from the University of Minnesota. Dr. Hensel came to Lineagen following more than 12 years as a scientist at Myriad Genetics. He has extensive experience in the identification of disease-related genes, and has contributed to the identification of genes for major depression, obesity, and lung cancer. He received his Ph.D. from the Department of Genetics and Cell Biology at the University of Minnesota and holds bachelors degrees in biology and chemistry from Texas Lutheran College.